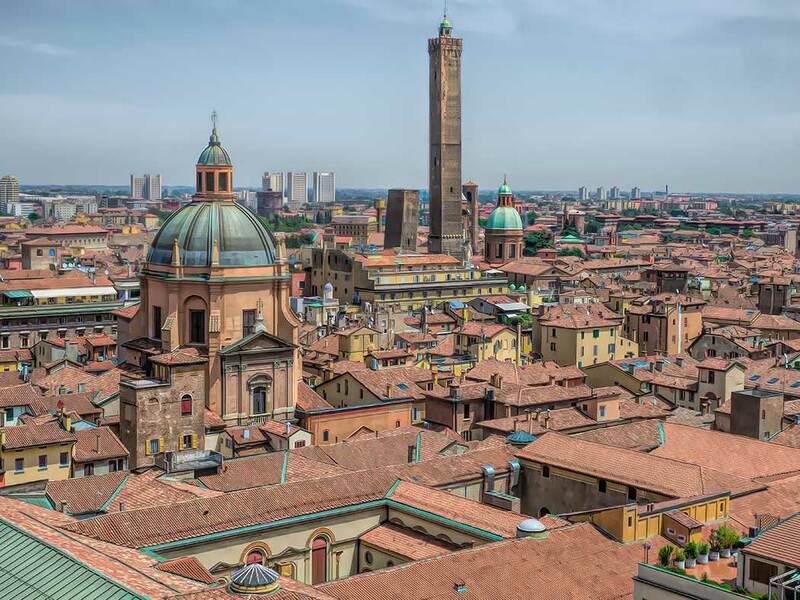 The beautiful skyline of Bologna, Italy, is best viewed from the rooftop terrace of the Basilica di San Petronio. The Basilca is located in Piazza Maggiore, which sits at the heart of the city and is the most popular gathering place for locals and tourists alike. Most visitors tour the inside of the church, as it is the tenth largest in the world by volume and the largest in the world built of bricks. It also contains some notable works of art, including a 219-foot long Meridian Line inlaid in the floor. Designed by the astronomer Giovanni Domenico Cassini, it was used to determine the length of the solar year and is one of the largest of its kind in the world. Remarkably, with focus on the size, unique construction, and history of the Basilica, most never discover that a tower at the rear of the church offers a rooftop viewing platform. The tower is not accessible from inside the church. Visitors must make their way to the rear of the building from the outside. Here, an elevator whisks them to a terrace on top of the tower, which soars high above most other buildings in the city. From the top, visitors enjoy not only a stunning view of the skyline of Bologna, but sweeping vistas to the surrounding hills. There is a fee of 3 Euros for the elevator ride.